A Canadian of the Vietnam era feels something unfamiliar, and in it sees the folly of being soft on terrorism. 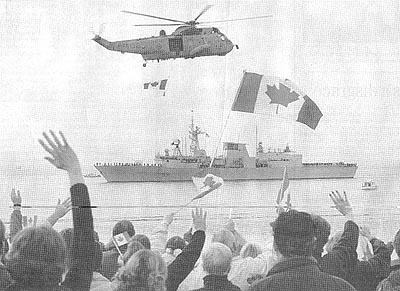 On Monday, when HMCS Vancouver sailed out of Esquimalt Harbour, a few hundred Victorians were expected to wave good-bye. But thousands, including me, showed up. We coated several kilometers of shoreline. A gigantic Canadian flag, spread across the lawns, sloped all the way down to the beach. When the brass band from the Naval base arrived, the scene took them by surprise. Seeking a place to stand, they marched single file through the crowd of sobbing wives and saluting veterans, nodding to the cheering citizens of all ages who stood waving tiny flags. Now, I've always considered myself to be a rational person, not easily moved by emotions, but when a spontaneous chorus of O Canada spread along the shore like the" wave" familiar to most sports fans, I found myself choking back tears. Curiosity, I thought, had drawn me there, but it was, undeniably, something else that had taken hold. The only word I can find to describe this unfamiliar feeling is "patriotism." As I meandered through the crowd, I heard murmurs of "Good Luck" and "God be with you". I read children's hand-made signs saying: "Daddy, we love you - come home soon" and I noticed that some of those more experienced with war, were holding up their hands, fingers separated and extended in the Churchillian "V". Notably absent were any expressions of anger and outrage so familiar to those of my generation - those of us born in peacetime, educated amidst the Vietnam War protest, and accustomed to a pervasive anti-war sentiment and a peace-keeper mentality. 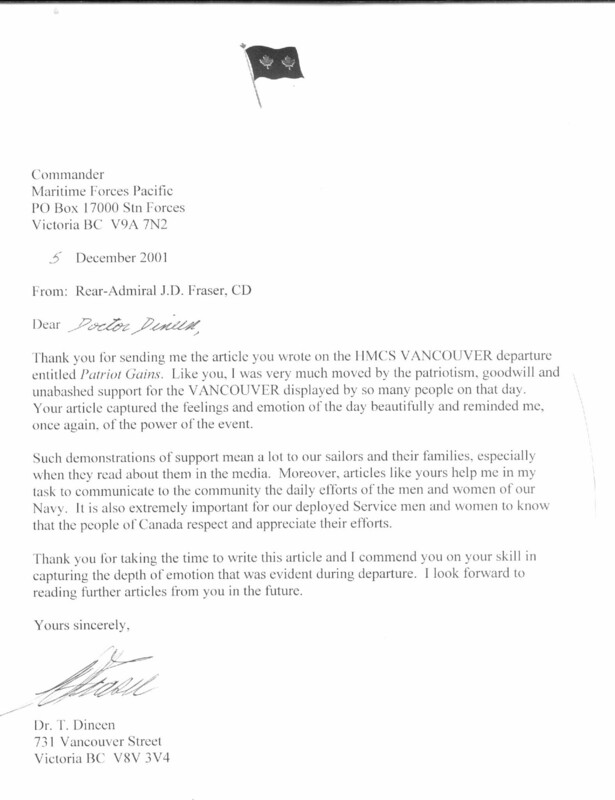 While the event was intended as a expression of goodwill for Canada's war-bound sailors, it seemed evident that with the ongoing anthrax scare, warnings of a next terrorist attack and the muddle of theories and arguments about this conflict, what we all needed was something positive, even uplifting. It's hard to accept that one can feel good about war but what we may have to realize is that, right now, we're in no position to choose between war and peace. If fighting back is what we have to do, remaining strong is crucial. We have to guard against any doubts that may weaken our resolve. Perhaps that's one of the reasons Thobani's feminist rhetoric of a few weeks back inspired such inflamed reactions. Her questioning of America's role in the making of the recent tragedies may not have been totally unreasonable but, under the circumstances, it was both senseless and pointless. Similarly, ruminations about the underlying psychological causes of terrorism only lead us astray. Of what possible significance is it that Susan Mirow, a specialist in trauma psychiatry and criminal justice at the University of Utah in Salt Lake City, believes that terrorists like bin Laden are "childhood victims of severe abuse, emotional neglect, and lack of love." "Terrorists get a sexual thrill from destruction," she says, and "they harbor revenge fantasies stemming from their feelings of helplessness, social disconnectedness, and rage." Whether Thobani, Mirow or others are on target or way off base in their analyses, is of no relevance at this time. At the best of times, their theorizing contributes about as much as counting angels on a needle's head. But now, in the worst of times, it's absurd to be considering an anti-patriarchal solution to the Taliban or therapy for bin Laden. Trying to understand can be dangerous not just because it distracts us from reality but also because asking "why" muddles our thinking and can have the effect of evoking compassion, even sympathy, for the enemy. Claude Lanzman, the author of the well-regarded Holocaust documentary Shoah, claims that to explain evil is to forgive it. "If you start to explain and to answer the question of Why," he says, "you are led, whether you want it or not, to its justification." "Tout comprendre c'est tout pardoner." I wouldn't go quite so far in dismissing efforts to understand but I am inclined to believe that asking the question "Why," and trying to understand terrorists and their acts is not something that's constructive for the public to engage in right now. Peter Suedfeld, professor emeritus in psychology at the University of British Columbia, agrees. Having devoted his career to the study of ethnopolitical violence, he thinks that there is a time and place for making a serious effort to understand. "But now is not that time," he states. "This is the time to stand by a decision without dithering and to dedicate ourselves to carrying it out." That seems to be precisely what people were doing here in Victoria just a few days ago. Likely, it's what people have been doing, and will continue to do, across Canada as our nation adjusts to the reality of war. Patriotism, as I've already admitted, is something new to me. Having lived my life thus far in peacetime, asking "why" has been an affordable luxury. But times have changed and so have I.